Episode 1 Japanese. Kuda is for kudagitsune, a pipe fox. he cannot be sent to the Dark Area. "This animal bullet of light carries a holy power in his earring!" 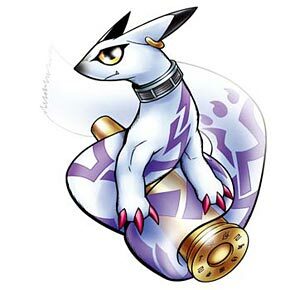 Digimon with the power of "sky" or "fighting" have +300 attack power. This Digimon's attack power is increased by +200 until the turn he is sent out ends. Dangan Senpuu means Bullet Whirlwind. Zekkou Shou means Perfect Shining.